How Do You Spell BOT? Correct spelling for the English word "bot" is [b_ˈɒ_t], [bˈɒt], [bˈɒt]] (IPA phonetic alphabet). 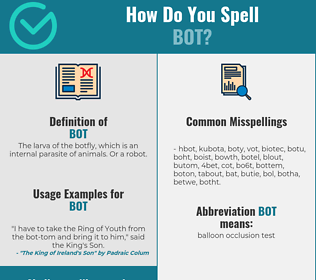 Below is the list of 336 misspellings for the word "bot". The larva of the botfly, which is an internal parasite of animals. Or a robot.